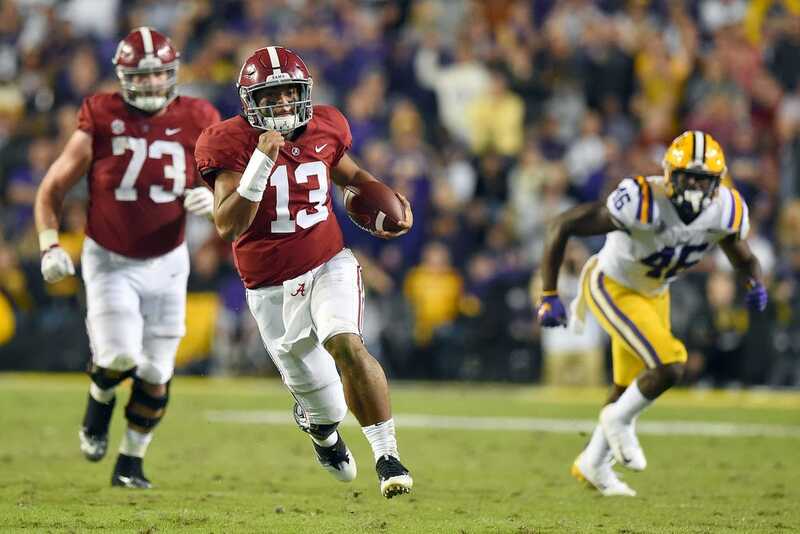 Alabama quarterback Tua Tagovailoa sprained his balky right knee in Saturday's win over LSU. But the Heisman Trophy frontrunner said after the win that clinched a spot in the Southeastern Conference title game that he will be on the field this week against Mississippi State. Tagovailoa was hurt on a 44-yard touchdown run in the third quarter. "I know when I hit the 30, my leg gave out, and I was just going off of momentum and trying to gallop into the end zone, and I made it, thank God," Tagovailoa said. Earlier in the game, Tagovailoa went to the sideline but missed only one play. He explained postgame the brief exit was unrelated to his knee. "He hit me in the goodies. Whew, that hurt," Tagovailoa said. "That hurt for a good minute. I couldn't breathe for a second." Tagovailoa, in his first season as Alabama's starting quarterback, has 27 touchdowns and one interception passing and 29 carries for 172 and three rushing touchdowns.